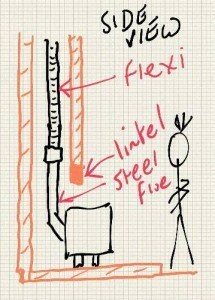 You are here because you want to fit your stove to a chimney liner within a fireplace recess (builder’s opening). Because chimney liners can only be used within a chimney then you must have a chimney. This is the most typical of the installations. The two elbows are required because otherwise the rear of the stove would be too close to the rear wall. 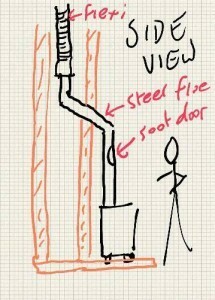 The flue is swept via the stove if the stove permits this, or one of the elbows will have a soot door. 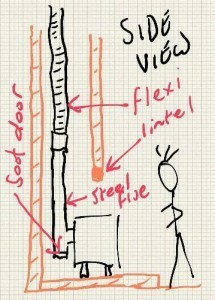 Here the fitter has chosen to fit the flue pipe to the rear of the stove – maybe to bring the stove more into the room. Soot build up is prevented by the soot collection area in the T. You must have access to the rear of the fireplace to access this soot collection area – so only wide builder’s openings are suitable. Sweeping is via the soot collection door or a soot door in the vertical flue (a sweep may desire both). Some stoves (Charnwood C-Series) have a purpose designed 45 degree rear exit, this ensuring soot cannot build up in the pipe. 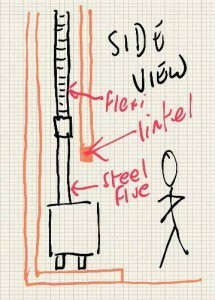 Sweeping is via the stove (if the 45 is designed to allow this) or a soot door in the vertical steel pipe (not shown on graphic). This option is excellent for bringing a small stove more into the room if the recess allows less air gap left and right than desirable. Nice and easy if your builder’s opening is deep enough (usually a depth of minimum 30cm is sufficient). 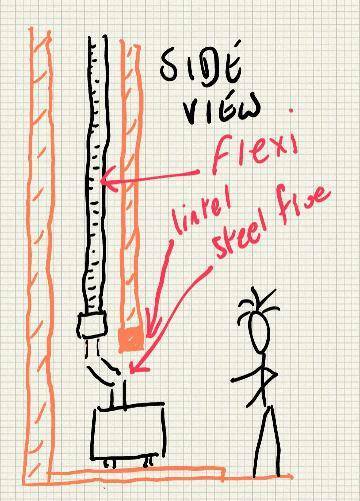 Sweeping is throught the stove if the stove design permits it (or via a soot door in the vertical steel flue pipe). It is very rare that I do this but it is a very viable option. The hearth and stove will take up more space within the room but it is fairly simple to do. The pipe passes through a hole in the chimney breast and is protected from your new mortar by fireproof rope or webbing.